Franklin Matters: Did you know Franklin has a wine club? The next Wine Club event is July 31st at 7 PM. Join the Meetup group of wine explorers. All events are sit down educational tastings. Since 1956 Michele Chiarlo is synonym with the wines of Piemonte. At a very young age Michele started to travel to showcase with unlimited passion what Piemonte could produce. With Michele's guidance now his sons Stefano and Alberto have taken over different roles and are carrying on their father's passion. 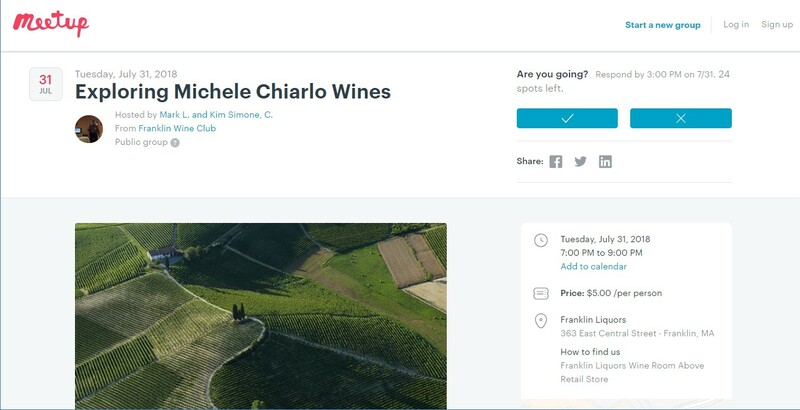 The story of Michele Chiarlo as a wine producer starts with Barbera and specifically from Asti but quickly moves to cover all the top areas of Piemonte, Gavi, Barolo, Barbaresco and more.